Home / Blog / How does scrap car yard work in Brisbane? Today automobile manufacturing is one of the largest growing industry across the world. Auto manufacturers add significant contributions to the worldwide economy. But not only this, they also focus on producing vehicles that are more eco-friendly. However, when vehicles get older or turn into end-of-life machines. It is crucial to get rid of it in order to prevent any undesirable harm to the environment and its surroundings. This is where salvage yards play a crucial role in eliminating the number of unwanted vehicles. Car scrap yards, also known as salvage yards are the best place where you can remove your junk vehicle quickly. At a wrecking yard, vehicles are dismantled for parts and the auto wreckers decide whether to recycle, resell or dispose them. This way they perform an important part in preventing the unwanted materials from getting into open landfills. Rather, they make sure to safely recycle every working part and carefully dispose the ones that are broken. You can easily find a salvage yard in Brisbane as they are established in most parts across Qld. They are particularly designed to remove any design of old or damaged vehicle. Read on to learn more about auto wrecking yards and how using their services can benefit you. This will help you to take an informed decision while dealing with a salvage yard in Brisbane, Queensland. When you find yourself with a wrecked vehicle, you will want the most hassle-free way to get rid of it. But you may wonder, what is the best place to sell your vehicle fast. The best possible option is selling it to an auto dismantler. Don’t just view them as a junkyard. They are one of the best place where you can not only dump your vehicle for good value. Plus, they ensure to use environment-friendly methods and safe standards while dealing junk automobiles. Unlike scrap yards, an auto wrecking company guarantees to offer the best ever cash for an old vehicle. It is because they know the art of making more money out of a scrap automobile. They follow a really simple procedure for this to give a fuss-free auto selling experience to customers. In today’s world most people are financially conscious so they are always willing to make additional money. This is absolutely true when it comes to selling a damaged, junk or maybe abandoned vehicle. The best solution for this problem is to contact salvage yards. They will take away your automobile and pay you higher cash. In addition, they can even provide you good quality parts that can save you good dollars. It can also include parts like bolts, nuts, etc. If the parts are in a perfect working order they are sold to a market selling spare parts. 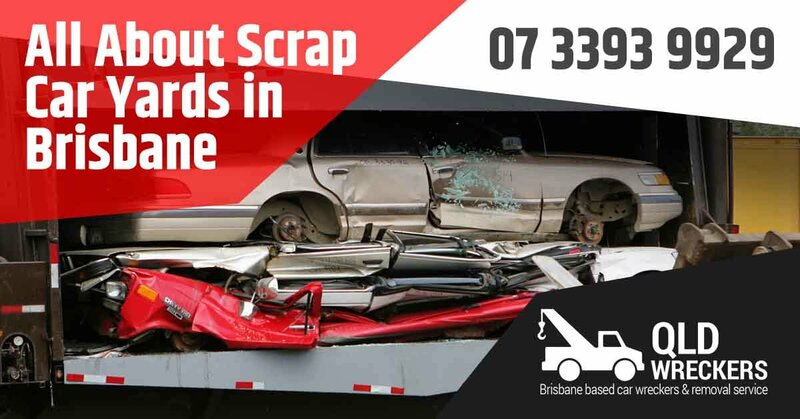 The team here at Qld Wreckers, guarantee to buy all type of scrap vehicles for highest dollar. So, make sure to call us today. You can actually drive any form of vehicle to a salvage yard. There are no exceptions because most professional auto wreckers are skilled enough to deal with their vehicle. However, you can still find many companies that only buy specific models. They only accept certain models based on their basic features. It includes mileage, size, odometer reading, engine size, model and condition. So, if you see a junk car lying on your property, don’t miss the chance to turn it into best cash. Visit your local wrecker’s cars for cash to sell your old automobile. What do they do with your car? Crucial question – what happens to your scrap car when sold to wreckers? Generally, your old vehicle may look no more than a huge piece of scrap to you. But in reality it is much more than that for every auto salvage yard. For wreckers, every unwanted vehicle is a treasure of useful parts. It is because they are knowledgeable enough to deal with a vehicle in any type of damage. By using their expertise their crew is able to pull out all of the useful parts or items from the vehicle. After removal, they ensure to carefully refurbish and resell the working car body components. Consequently, most wreckers own a massive inventory of wide range of used spare parts and accessories. That’s why, most people look for scrap yard car parts when it comes to getting quality components within a budget. Whereas the items that are not in a worn-out condition are offered in metal recycling facilities. These experts crush the damaged parts into metal pieces by applying eco-friendly methods. They are then sold for manufacturing of various items. How to scrap your car in Brisbane? When it comes to getting in touch with a Brisbane Auto Wrecking Yard like Qld Wreckers you only need to follow a few simple steps. This way you can quickly get rid of your junk vehicle in return for immediate cash. After you select a reputable scrap car removal business in your location, just visit their website to find their contact details. So, you can directly speak to them by giving a call. You can talk to their representative to get a clear understanding of their services. Plus, you can also get a free and no-obligation price estimation of your automobile. If you like their offered price, you can quickly schedule a removal appointment. They will have a professional removal team which can reach you at any place. No matter what sort of damage your vehicle has accumulated they will be able to tow it away without trouble. You can fix an appointment at any time as these businesses operate 24/7. This is probably the best part of using Cash for Car service. Most of them will pay you the full guaranteed cash immediately before towing away your wheels. So, you don’t need to wait for days or weeks to get payment. These people also take the job of preparing the related documents so you only need to sign it. If you live in Brisbane and searching for “car junkyard near me”, then Qld Wreckers are the best place to visit. We offer the best auto removal, dismantling and recycling services in Qld. Apart from this we are the leading scrap dismantling yard when it comes to offering top quality spare parts. Therefore, make us a call today at: 0416 615 100 and sell your old car for quick cash. If you like, you can also interact with us online via our online quote form. Our helpful and kind representatives would love to help you. Get to know more about scrap metal recycling using the WIKI link.